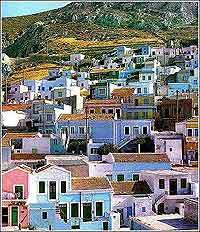 Karpathos island is located between the two well know Greek islands of Rhodes and Crete, with a history dating back to the Minoan era and Mycenean tombs and settlements going back to the second millennium B.C. With so much living tradition on the island, Karpathos' music is particularly vivid and haunting, and will ring in the ears long after the visitor has traveled to some sunny crowded island elsewhere in the Aegean. Here, musicians are respected community leaders, who often have the skills to make their own instruments as well. On Carpathos, the windmills still put in a full day's labor, and don't have the luxury of being merely decorative like their famous Mykonian counterparts. The mountainous tracks of Carpathos are ideal for hiking, and several suggested treks can be followed by the interested visitor. 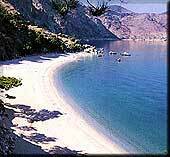 But Carpathos has as many beautiful beaches as it does rugged mountains. Generally, Karpathos beaches are uncrowded, perfect crescents of sand against vivid blue water which will provide a nice break from hiking or sightseeing. 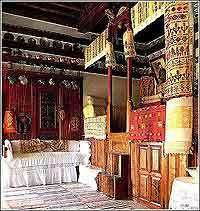 Karpathos or Pigadia the capital - is marked by the peculiar Karpathian houses, built of carved stone, full of embroidery and characteristic interior decorations. From Pigadia you can visit Kyra Panagia, a picturesque bay with a marvellous beach and a monastery of the same name. 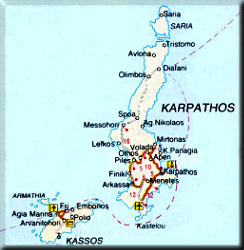 A little further, on the northern promontory of Karpathos, lies the Diafani village; on the nearby little island of Saria we see Palatia, with ruins of the ancient city of Nisyros. In Karpathos you have the opportunity to taste traditional local dishes like "amemoula", chickpeas, pilau rice and sweets like baklava. Aghios Mammas, Kimissis Theotokou (Menetes), Aghia Sofia, Ypapanti (Arkassa), Kimissis Theotokou (17th century, Othos), Panaghia (6th century), Aghios Onoufrios, Aghia Triada, Moni Chrissovalantou (Olympos). Beaches such as Vrontis (Karpathos), Amopi (Menetes), Kira-Panaghia (Aperi), Lefkos (Mesochori), Agios Nicolaos (Spoa) and Agios Nicolaos (Arkassa) are the most organized with tavernas and rooms to let. Less touristic and rather isolated are the beaches of Achata (Aperi), Apella (Vollada), Phokia, Agios Thoros and the seaside village of Finiki. Tristoma: Poor shelter; Anchored off; No fuel or water; taverns om the meltemi.